Common grasshopper warbler, named for its conspicuous song, which closely resembles the chirp of a grasshopper. Click to enlarge. Last year I was all excited because I had found a surprisingly high number of common grasshopper warbler (locustella naevia) in a local reedbed. As it turns out they haven’t quite reached the same kind of numbers this season (there were between 5 and 7 singing males), but something else, no less exciting, showed up near by this season; the southern bluethroat (luscinia svecica). It wasn’t the same reed bed, or even the same side of our little peninsula, but close enough, and there are many of them! When I was last there I counted no less than 4 singing males, and this is a high concentration considering the bird has only been a known breeder on our island for a couple of years, and it has never (to my knowledge) been seen around here before. While I was photographing the bluethroats the reed warblers (acrocephalus scirpaceus) kept stealing my attention. The light was great, the camera was ready, and the birds were attractive – so I shot quite a few shots of them as well. 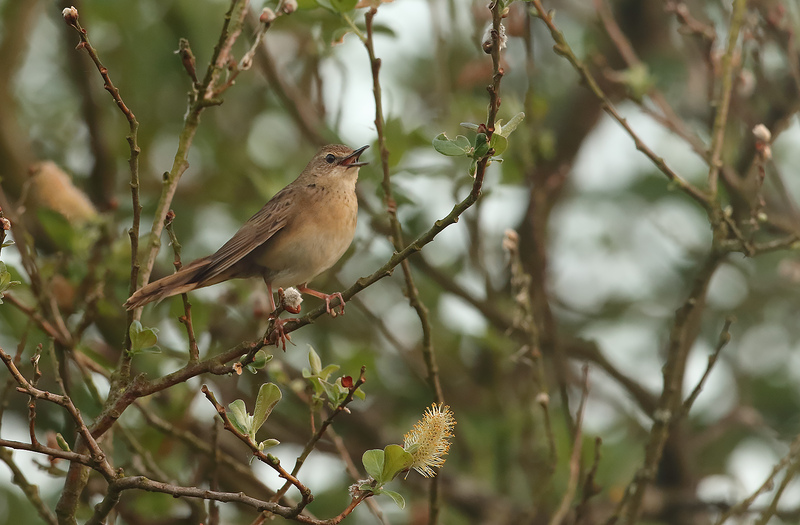 When I got home I almost fell off my chair, as there seemed to be another exotic among them, namely a great reed warbler (acrocephalus arundinaceus). I have consulted the experts, and there just doesn’t seem to be anyone willing to categorically say either or, so for now this last bird, in my files, goes in as unidentified, probably great. If you’re certain either way please do let me know. The great reed warbler is a rarity around here, and before you complain that I should have been able to tell from the size alone let me tell you that when looking out from a small opening in a portable tent hide, size just isn’t that apparent – all I remember thinking was that most of the reed warblers were really small… The next day I headed off for ten days in the Swedish bush, so I haven’t been down there to check which one it was – maybe I should get going now. The gallery thus comprises two, maybe three different species; the southern bluethroat, the reed warbler and maybe, just maybe, the great reed warbler. Click on the first image to scroll through the images. The suspected great reed warbler – main diagnostic feature is the bill, which is simply highly irregular for a reed warbler. Very attractive birds, the bluethroats. Happy to call them neighbours. Experimenting with some different crops. The first shot I got, a few nights before the others. More messy, and less attractive light.